Congratulations to the winner, Chef Ray Pullen from the Royal Exchange Hotel Katanning! The five finalists competed in the 2011 Steak Sandwich grand final cook-off at Hospitality Expo 2011, Burswood Entertainment Complex at 2pm on Wednesday 2 May. The Royal Exchange Hotel’s steak sandwich was judged the best of five finalists by a panel consisting of former Channel 9 newsreader Dixie Marshall, 882 6PR’s Steve Mills, Lion Nathan’s Tim Islip and The West Australian’s Rob Broadfield. 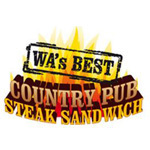 The panel crowned the Royal Exchange Hotel as the overall winner of the title ‘2011 WA’s Best Country Pub Steak Sandwich’, with "A steak that melts in your mouth combined with the other ingredients makes for a taste sensation served with awesome country hospitality." Chef Ray Pullen won the panel and the crowd over with his sandwich featuring Black Angus scotch fillet, toasted ciabatta bread, gruyere cheese, sliced tomato, rocket, homemade beetroot & horseradish relish, homemade garlic mayonnaise, served with a side of hand cut chips and beer battered onion rings seasoned with chilli sea salt.